Sign up for our special coverage here. Why is the Trump administration sending so many people to Davos? The question is preoccupying Trump-watchers of every stripe as the global elite gather in the Alpine town to kick off their annual gathering Tuesday at the World Economic Forum. If the U.S. government shutdown doesn't scramble plans, eight Cabinet-level figures and at least seven other top-ranking officials are scheduled to make the trip — a heavy contingent compared to those of their predecessors — and Trump himself is set to cap off the conference with a Friday speech, the first appearance there by a president since Bill Clinton in 2000. Trump officials en route to Switzerland include: Treasury Secretary Steven Mnuchin leading the bunch, with appearances by Secretary of State Rex Tillerson, Commerce Secretary Wilbur Ross, Energy Secretary Rick Perry, Homeland Security Secretary Kirstjen Nielsen, Transportation Secretary Elaine Chao, Labor Secretary Alex Acosta, U.S. Trade Representative Robert Lighthizer — along with senior adviser Jared Kushner, Thomas Bossert, a top counterterrorism and homeland security adviser, USAID Administrator Mark Green, and FDA Commissioner Scott Gottlieb. More heavyweights are scheduled to make the trip with the president later this week (if indeed Trump goes): Chief of Staff John F. Kelly, national security adviser H.R. McMaster and National Economic Council Director Gary Cohn. The administration will decide on a “day-to-day basis” whether Trump and his Cabinet make the trip, White House budget director Mick Mulvaney told reporters Saturday (though conference founder Klaus Schwab said Sunday he still expects Trump to attend, for what it's worth). In any other administration, the multitude would be the message: A big delegation signals an endorsement of the conference’s center-left push for more international engagement on trade, climate change, refugees and other pressing, cross-border concerns. This administration is obviously different. When Trump pledged to champion the “forgotten men and women” in his inaugural address a year ago this past Saturday, most took it to suggest a shunning of the globalist order personified by those rubbing puffy-coated shoulders in Davos. Indeed, there were grumbles in Davos back in 2013 about the perceived meagerness of the Obama delegation, though the forum coincided with the president's second inaugural celebration. The following year saw a relatively beefier group: Secretary of State John F. Kerry, Treasury Secretary Jack Lew, Commerce Secretary Penny Pritzker and Environmental Protection Agency Administrator Gina McCarthy. In 2015, Vice President Joe Biden led a group that included Kerry, Defense Secretary Ashton B. Carter, Attorney General Loretta E. Lynch and Health and Human Services Secretary Sylvia Mathews Burwell. And Biden was back in 2016, along with six Cabinet secretaries, for the last year of the Obama era. The plethora of Trump attendees could be jarring in a week when their government may still be shut down (a Senate vote is slated for noon Monday), or if it's not, has just barely clawed itself out of a deep political hole. But the bigger question is whether the Trump Davos army is coming to promote the president's “America First” agenda, or speak more diplomatically with a world community still trying to grapple with this administration. Complicating that mission: Officials making the trip are at odds with one another on some definitional issues. While Lighthizer and Ross, for example, have encouraged Trump’s protectionist instincts, Cohn has tried to hold the line for freer trade. The former Goldman Sachs president has the deepest experience at Davos among the Trump officials set to go this year. Back in 2009, as Wall Street’s banking titans dialed back their presence amid the global financial crisis, Goldman sent Cohn as its top emissary. Then, he worried aloud about a populist backlash to the bailouts of the auto and banking industries. Eight years later, he joined an administration that rode that very backlash to power. PROGRAMMING NOTE: I'm en route to Davos to cover all the action this week, so The Finance 202 will be hitting your inboxes at 6 a.m. Swiss time (12 a.m EST) today through Thursday, and Friday morning after Trump's speech. If you're attending, tell me what you're seeing and hearing -- and pass on any questions, concerns and complaints (and of course noteworthy sightings). Please email me at tory.newmyer@washpost.com. And if you're not signed up for my newsletter, please do so here. 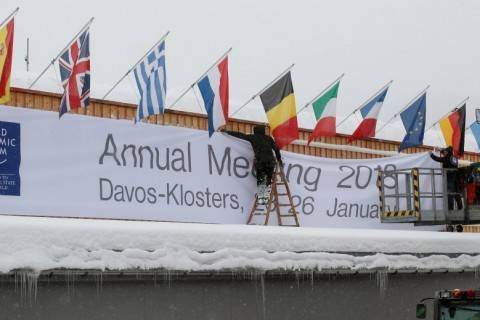 No trickle-down: Davos is still dominated by men despite some progress at the top, writes The Washington Post's Danielle Paquette in a preview story. This time, all of the forum's co-chairs are women. They include Sharan Burrow, general-secretary, International Trade Union Confederation, Belgium; Fabiola Gianotti, director-general, European Organization for Nuclear Research (CERN), Geneva, Switzerland; Isabelle Kocher, chief executive officer, ENGIE, France; Christine Lagarde, managing director, International Monetary Fund (IMF), Washington; Ginni Rometty, chairman, president and chief executive officer, IBM Corporation, United States; Chetna Sinha, founder and chair, Mann Deshi Foundation, India; and Erna Solberg, prime minister of Norway. 23 percent of the world’s parliamentarians are women, according to the latest United Nations numbers — an increase from 11.3 percent in 1995. Only 6.4 percent of Fortune 500 chief executives, meanwhile, are women. They hold 26.4 percent of executive and senior-level roles at S&P 500 companies, according to Catalyst. They fill 21 percent of board seats at such firms. Economics is also teeming with men. Thirteen percent of academic economists in full-time jobs are women in the United States. The United Kingdom's share is 15.5 percent. A bright spot for gender equity: “Of the 130 professionals under age 40 invited this year, half are women, Vanham said,” reports Danielle. For more on the all-female co-chairs, the New York Times's Bérengère Sim‏ profiles six of the seven women leading the charge this week. 1. Can German Chancellor Angela Merkel claim the mantle of leader of the West given Germany's complicated internal politics? Bremmer notes Merkel didn't even confirm her attendance at the World Economic Forum until this past weekend. 2. What will India's Narendra Modi say in the opening speech? Bremmer writes that Chinese President Xi Jinping used the same event at Davos last year to kick of a big PR tour. 3. Which version of Trump will show? The showman who likes the glitz and cameras of Davos, or the “America First” leader? Or both? 4. How seriously will inequality be taken? I wrote about BlackRock's Larry Fink's decision to urge top corporate honchos to spend part of their windfall from U.S. tax reform on social good. Will others follow his lead? 5. Globalization gets new scrutiny, which is not a bad thing, Bremmer argues. — More on Modi's moment as the opening speaker. WSJ's Eric Bellman: "... Modi prepares this week to address global business and political leaders in [Davos], as his country passes France and the United Kingdom to become the world’s fifth-largest economy, underscoring the South Asian nation’s drive for recognition as a great power. Some economists calculate that India’s gross domestic product jumped into the top five last quarter as it continued to outgrow every country in Europe—and for that matter most of the rest of the world. The [WES]... will be another venue for Mr. Modi to push India’s geopolitical agenda to win a more prominent place in the circles that shape the world’s rules and institutions. 'India can’t be a spectator. India doesn’t want to be just a participant,' said Ram Madhav, general secretary of Mr. Modi’s Bharatiya Janata Party at a conference last week. 'India wants to be a stakeholder.' "
— Trump vs. the world he insults. The New Yorker’s Amy Davidson Sorkin asks: “Mapping every nation that Trump has insulted is an exhausting task. It’s easy to imagine this year’s meeting playing out as scenes from a very dark screwball comedy: Trump tries to shake a gaggle of allies whom he has called deadbeats, in order to persuade Erna Solberg, the Prime Minister of Norway, to send more white people to America ... This is what might be called the Davos dilemma: countries may scorn Donald Trump, but they are not quite ready to dismiss the President of the United States." Will Trump move markets? Simon Derrick, chief currency strategist at Bank of New York Mellon, via CNBC: "From an FX perspective it will be interesting to see whether he has anything to say on the issue of dollar weakness, given that he spoke on a number of occasions in 2016 and early 2017 about the issue of currency manipulation. Anything on domestic spending will likely catch attention as well, given the rise in U.S. Treasury yields." The Financial Times's Gideon Rachman writes that Trump still "calls the tune" at Davos, but that many world leaders are more relaxed about him than they were a year ago. "The WEF is keen to welcome Mr Trump. Co-opting “difficult” political figures is the name of the Davos game. An organisation that has in the past rolled out the red carpet for figures as diverse as the presidents of Russia and Iran is eager to embrace Mr Trump ... Those attending also want to understand exactly how Mr Trump intends to advance his trade agenda. If his administration decides to pursue China through the World Trade Organization, it might find support from the EU. But if the US looks as if it is trying to go around the WTO — or even actively undermine it — the reception for Mr Trump is likely to be a lot cooler." — Macron to make investment push. AP: “French President Emmanuel Macron will be hosting over 100 CEOs of major multinationals at the chateau of Versailles to try to persuade them to invest, and especially hire, in France. Macron will vaunt his government’s changes to French tax and labor law, as he tries to attract foreign investors wary of France’s traditionally high taxes and worker protections. — Global economy on the agenda: From the NYT’s Michael Schuman: “Almost a decade after the financial crisis, economies in just about every corner of the world — the United States, Europe, even perennially sluggish Japan — are growing in unison. But can the expansion last? A World Economic Forum paper on “misconceptions” about trade singles out the United States. The Senate adjourned late Sunday for the night without a deal to end the shutdown, and a vote originally scheduled for 1 a.m. was rescheduled for noon on Monday. “We have yet to reach an agreement on a path forward that is acceptable to both sides,” Senate Minority Leader Charles E. Schumer (D-N.Y.) said after Senate Majority Leader Mitch McConnell (R-Ky.) announced he would be willing to start debate on immigration legislation if no deal was reached by early February. — Roll Call: Here’s a look at how every senator voted on whether to keep the government funded, via the New York Times. — But the president is laying low: The Post’s Josh Dawsey and Ashley Parker: “President Trump stayed out of public view this weekend as delicate negotiations continued to fully reopen the federal government, sharing his opinions publicly only in sporadic, tweet-sized bursts. His closest advisers and allies would like this hide-and-tweet strategy to continue. Trump — whose natural inclination is to place himself squarely in the action — initially wanted a deal…But over the weekend, senior aides — such as Chief of Staff John F. Kelly, legislative affairs head Marc Short and budget director Mick Mulvaney — and Republican congressional leaders cautioned Trump against negotiating with Schumer, arguing the New York Democrat is in a tough spot and will ultimately have to capitulate. — The vice president is a world away (and not in Davos). Politico’s Matthew Nussbaum: “He left Washington on Friday night for a trip to the Middle East, hours before the government shut down amid an impasse between Democrats and Republicans over extending protections to young undocumented immigrants. On Saturday, as Trump worked the phones at the White House, the vice president was being welcomed to Egypt by President Abdel Fatah al-Sissi, kicking off a trip that will also include stops in Israel and Jordan. — Investors lose access to key data. The Wall Street Journal's Sharon Nunn: “Market-moving data that influences trillions of dollars of daily trading flows in stock, bond, currency, commodities and derivatives markets may not be published while the government remains closed. Measures of gross-domestic product and employment — collected by government agencies that are considered nonessential when the government is closed — are scheduled for release in the next two weeks. — But investors continue to brag. From Bloomberg’s Kailey Leinz and Sarah Ponczek: “After a year of political spectacle, it’s doubtful a government shutdown will be enough to divert investors from the economic and earnings tidings that have occupied Wall Street’s minds of late. As long as it doesn’t last too long. “What closes when the government shuts down?” from The Post’s Kim Soffen and Reuben Fischer-Baum. “From Tax Refunds to Restrooms, What the Shutdown Has Shut Down,” From Bloomberg’s Christopher Flavelle. “What Will Happen if the Government Remains Shut Down,” an interactive from The New York Times’s Alicia Parlapiano and Karen Yourish. “What’s happening at the IRS during the shutdown,” from CNN Money’s Jeann Sahadi and Jackie Wattles. Indian Prime Minister Narendra Modi is scheduled to deliver the opening plenary address on Tuesday. Canadian Prime Minister Justin Trudeau is scheduled to speak on Tuesday. Brazilian President Michel Temer is scheduled to speak on Wednesday. French President Emmanuel Macron is scheduled to speak on Wednesday. German Chancellor Angela Merkel is scheduled to speak on Wednesday. Italian Prime Minister Paolo Gentiloni is scheduled to speak on Wednesday. British Prime Minister Theresa May is scheduled to speak on Thursday. Argentinian president Maricio Macri is scheduled to speak on Thursday. President Trump is scheduled to speak on Friday. Professor Klaus Schwab, founder and executive chairman of the World Economic Forum, hosts a welcome reception in Congress Centre, Plenary Hall Lobby at 7:30 p.m.
An interactive panel on infrastructure and development will take place at the Congress Centre, Jakobshorn at 8:15 a.m. Tuesday. An interactive panel on The Power of Economic Narratives will be held at 8:15 a.m. At the Congress Centre, Salon on Tuesday. An interactive panel on a strategic outlook for the future of energy systems will be held at the Congress Centre, Aspen 2 at 8:30 a.m. on Tuesday. A televised session on global markets will begin at 8:30 a.m. in the Congress Centre, Sanada on Tuesday. An interactive panel on the next financial crisis will start at 9:45 a.m. in the Congress Centre, Aspen 1 on Tuesday. An interactive panel on global production systems will begin at 9:45 a.m. in the Congress Centre, Parsenn on Tuesday. A televised session on automation, privacy and misinformation will start at 10 a.m. in Congress Centre, Sanada on Tuesday. A session on class privilege will start at 2 p.m. in The Loft, Hub A on Tuesday. A session about beyond basic income will start at 2:30 p.m. in the Congress Centre, xChange on Tuesday. An interactive panel on gender, power and stemming sexual harassment will start at 4 p.m. in Congress, Centre, Sanada on Tuesday. A televised session on saving economic globalization will start at 4 p.m. in Congress Centre, Aspen 1 on Tuesday. A televised session on capitalism will begin at 5:30 p.m. in Congress Centre, Sanada on Tuesday. An interactive panel on global arms markets begins at 9 a.m. in Congress Centre, Situation Room on Wednesday. A lunch session on “China: Open Up for Prosperity” starts at 12:30 p.m. in Hotel Derby on Wednesday. A lunch session on disaster resilience in infrastructure will start at 12:30 p.m. in Morosani Schweizerhof, Arvenstube on Wednesday. A session on big data in policy making in Congress Centre, Science Hub starts at 12:45 p.m. on Wednesday. A workshop on building sustainable economic systems will begin at 2:30 p.m. in Congress Centre, Atelier on Wednesday. A session on life-work balance will begin in The Loft, Sayaban at 3:15 p.m. on Wednesday. An interactive panel on a shared vision for financial inclusion will begin at 3:30 p.m. in Congress Centre, Jakobshorn on Wednesday. A televised session on systemic trade collapse will begin at 4:45 p.m. in Congress Centre, Aspen 2 on Wednesday. A session on shaping the fourth industrial revolution will begin at 5 p.m. in Congress Centre, Forum Hub on Wednesday. A televised session on the global impact of “America First” will begin at 6 p.m. in Congress Centre, Aspen 2 on Wednesday. An interactive panel on the intelligence market will begin at 9 a.m. in Congress Centre, xChange on Thursday. A televised session on the remaking of global finance will begin at 11 a.m. in Congress Centre, Sanada on Thursday. A televised session on new avenues for global trade will begin at 1 p.m. in Congress Centre, Aspen 2 on Thursday. A session on the big picture on trade will begin at 2:45 p.m. in Congress Centre, Global Situation Space on Thursday. A dinner session on “The State of the World with Nobel Laureates in Economics” will begin in Central Sporthotel at 8 p.m. on Thursday. An interactive panel on famine and food security will begin at 9 a.m. in Congress Centre, Situation Room on Friday. A televised session on the future of Asian economics will begin at 9:15 a.m. in Congress Centre, Aspen 2 on Friday. An interactive panel on the state of startups will begin at 9:15 a.m. in Congress Centre, Aspen 1 on Friday. A session on the rise of women entrepreneurs will begin in Congress Centre, xChange at 10:45 a.m. on Friday. A lunch session on the business of Brexit will start at 12:30 p.m. in Morosani Posthotel, Davoserstube on Friday. An interactive panel on the global economic outlook will begin at 1 p.m. in Congress Centre, Congress Hall on Friday. The closing concert in Congress Centre, Congress Hall will begin at 5:30 p.m on Friday.